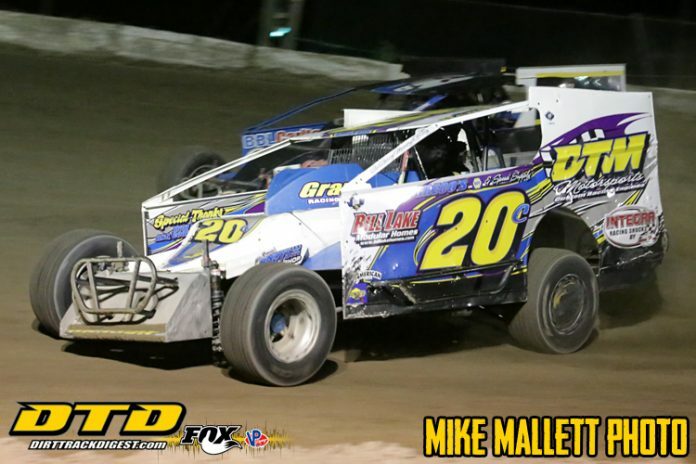 AFTON, NY – The curtain came down on the 2018 racing season at the Afton Motorsports Park on Friday night. The final night of racing witnessed some really good racing action and seven track champions being crowned at the end of the racing program. 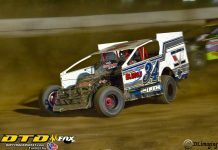 In the ZMK Construction Modifieds Craig Hanson dominated the feature to get his first win of the year. Brett Tonkin came from 11th to end up second to win the track championship. 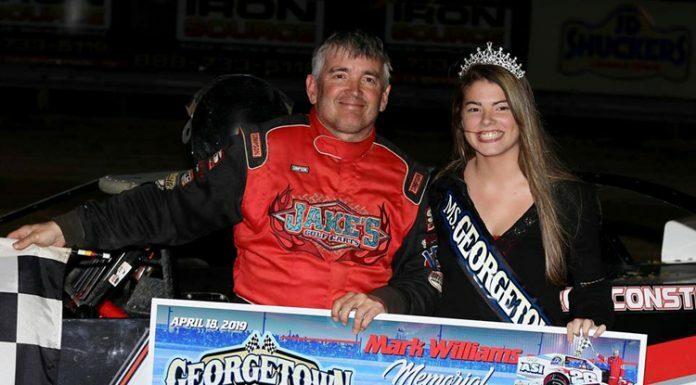 The Chambers & O’Hara Open Sportsman saw the biggest upset of the night in the point standings. As Dennis Clapperton, who was third in points coming into the show, won the feature and with some racing luck on his side became the track champion. Corey Cormier won the Butler Auto Sales Crate Sportsman feature and with the win he clinched the track championship. In the Rinker Insurance Agency Street Stocks saw Butch Green already clinch the track championship before the races started, Dave Cronk won the feature on the evening. In the Trophy Guy IMCA Modifieds there were two champions crowned on this night. Due to the IMCA Boone Nationals taking place, there were no national IMCA points awarded on this night and this meant that Beau Ballard is recognized as the IMCA champion. With the track championship still on the line Tyler Stoddard went out and won the feature to win the track championship. Stoddard and Ballard ended up tied in points and Stoddard is recognized as track champion due to more feature wins than Ballard. The Four Cylinder Trucks saw Ralph Cuozzo already clinch the track championship before the races started and he went out and won the feature. The 30 lap ZMK Construction Modified feature was brought to the green by Steve Babicek and Craig Hanson with Hanson using the outside line to grab the lead over Babicek, Darwin R. Greene, Rusty Smith, and Paul Jensen. The top five stayed the same following a lap one restart and on lap four a big move was made by Brett Tonkin, who started 11th. Tonkin consistently all year long came from the rear of the field on a weekly basis moved into fourth on lap four. The final restart of the race took place on lap five and on the restart Tonkin continued his charge to the front as he moved into third. Up front Hanson was blistering the field and quickly opened up a full straightaway lead by lap ten. Tonkin had now pulled up to the back bumper of Green for second while Mitch Gibbs, Babicek, Smith, Paul Jensen, and Kenny Titus all raced for positions four through eighth. 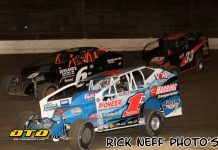 Hanson in his first season as a regular at the track showed what he has learned throughout the season was paying off as he opened up a half a track lead with ten laps to go. Tonkin meanwhile finally got past Greene in heavy lap traffic with six laps to go. Now right on his back bumper were the duo of Gibbs and Smith who were now charging through the field. Smith took to the high side of the speedway to put on a passing exhibition over the final five laps. With the two to go signal being given Smith made a daring three wide pass of Greene and Gibbs to go from fifth to third. At the checkers Hanson in for the win over Tonkin who won the track championship with a second. Smith coming home in third with Gibbs in fourth, and Greene in fifth. Qualifying heats were won by Jensen and Babicek. The 20 lap Chambers & O’Hara Open Sportsman feature was brought to green by Skip Pickwick and Dennis Clapperton. The action started even before one lap was scored as point leader Tyler Hart spun out in turn two to bring the yellow out. On the restart Clapperton was able to motor past Pickwick to get the lead with Dan Burman, Dave Rosa, and Bill Deckleman in tow. Second generation racer Clapperton opened up a big lead quickly. This left Pickwick to do battle for second with Burman, Rosa, and Deckleman. With Clapperton now opening up a straightaway lead and Pickwick racing comfortably in second. A terrific race for third was shaping up between Deckleman, Rosa, and Burman, as the three veteran drivers were exchanging third place nearly every lap in a crowd pleasing performance. Rosa who needed to finish second or better to win the track championship took control of third on lap seven and applied immediate pressure on Pickwick for second. Up front Clapperton knew that if he wanted to win the track championship he needed to win the race first and get some help from the racing gods. Rosa needed to finish worse than second and Hart needed to finish worse than sixth. At the checkers Clapperton in for his first win of the year over Pickwick, Deckelman, Rosa, and Burman. Deckleman was placed back one spot for rough riding and this moved Rosa into third. With the finish being official Clapperton won the track championship by two points over Rosa. Qualifying heats were won by Pickwick and Clapperton. The Butler Auto Sales 20 lap Crate Sportsman feature was brought to the post by Ed Utter and Fred Christ. Christ got the lead at the drop of the green over Kinser Hill, Utter, Corey Cormier, and Blaine Klinger. Cormier looking for the track championship moved into third on lap three with Klinger right on his tail to grab fourth one lap later. On a lap five restart Hill looking for his first win of the year used the outside lane to grab the lead over Cormier, Christ, Klinger, and Bobby Flood. The race would take a dramatic turn on the next lap as exiting turn four to complete lap seven leader Hill spun in front of the pack. Cormier barely squeezed by to keep his track title hopes alive, but the same couldn’t be said for several other racers. Christ, Klinger, Flood, and Aaron Shelton were all involved with all four going pitside and all four returning after quick pit work. When racing resumed Cormier took control of the number one spot over Rob Loucks, Kamdin Maby, Gary Smith, and Dustin Harris. Smith who was the closest competitior to Cormier for the track title moved into third on lap eight and into second on lap 12. In lap traffic on lap 14 Smith pulled even with Cormier for the lead until the yellow lights flashed on for debris on the racing surface. Cormier held off the relentless challenges of Smith over the final six laps to claim the win and track championship. Smith, Maby, Loucks, and Shelton rounded out the top five. Qualifying heats were captured by Klinger and Christ. The 20 lap Rinker Insurance Agency Street Stock feature saw a season high car count of 17 taking the green with Shawn Stalker and Donald Briggs on the front row. Briggs got the jump on the start to get the lead over Dave Cronk, Stalker, Bob Crandall, and Butch Green. Cronk moved under Briggs who pushed up the track in turns three and four to get the lead on lap three. Crandall and Green both moved past Stalker for third and fourth respectively on this lap also. Green got past Crandall for third on lap four while Jake Fowlston moved into fifth. The driver who was drawing plenty of attention was Doug Polhamus who started 12th and by lap six he was in sixth. Up front Cronk built up a good lead over Green who moved into second on lap seven, the first yellow of the race came out on lap ten. With two restarts taking place over the next two lasp the big mover during these restarts was Polhamus who moved form sixth to fourth, Polhamus moved into third on lap 12. Green was starting to reel in Cronk for the lead until lap 14 when Green pulled to the highside of the track and rolled to a stop to bring out the yellow. This would end the race for Green, but he had already clinched the track championship before the feature started. On the six laps to go restart Polhamus applied heavy pressure on Cronk for the lead. Meanwhile Crandall, Shane Wolf, Jr., Jake Fowlston, Matt Spencer, and Tom Osborne had a great race shaping up for positions three through seven. The great race of Crandall ended with one lap to go as he rolled to a stop to bring out the yellow. The final lap was anti climatic as Cronk raced to the $650 win over Polhamus, Wolf, Osborne, and Jake Fowlston. Qualifying heats were won by Jake Fowlston and Green. Jake Maynard and Lenny Miller brought the 20 lap The Trophy Guy IMCA Modified feature to green with Maynard getting the lead over Tyler Stoddard, Beau Ballard, James Cornell, and Miller. Maynard looking for two wins in a row opened up a narrow lead with Stoddard riding in second while Ballard and Cornell raced hard for third. The hard racing for third betwene Ballard and Cornell resulted in the first yellow as both cars spun out on lap seven. On the double file restart Maynard motored back into the lead over Stoddard, Miller, Bill Nichols, and Eric Stumpf. Lap eight featured another double file restart and this time Stoddard was able to run the perfect line on the outside of Maynard to trap him down low and grab the lead. A rash of yellow flag fever hit the division as another double file restart on lap ten took place. This time Stoddard pulled away to the lead and when Maynard slipped up the track this allowed Ballard to get by for second and Cornell was able to sneak by for third. The final ten laps all eyes were on Stoddard and Ballard who were racing for the championship. If Stoddard won the race, he would tie Ballard for the points and since he won more features, he would claim the crown. Ballard had already claimed the IMCA title as this race was being held during the Boone Nationals and no IMCA points are awarded during this event. Stoddard made one mistake on lap 16 as he pushed up in turn four and this allowed Ballard to pull even at the line. Stoddard was able to keep the lead and led the final four laps to win the race and track title over Ballard, Cornell, Maynard, and Nichols. Stoddard swept the evening as he won the qualifying heat race. Brandon Loucks and Scott Chapman brought the 15 lap Four Cylinder Truck feature to green. Loucks moved into the lead over Ralph Cuozzo, Bob Crandall, and Chapman. Cuozzo who was looking for his tenth feature win of the year wasted little time as he got under Loucks to grab the lead on lap three. Crandall was able to move past Loucks for second on lap four and set his sights on Cuozzo. But Cuozzo would have nothing of it as he pulled away for the win and track title over Crandall, Loucks, and Chapman. NOTES; the fine folks of Butler Auto Sales sponsored the evening of racing and they enjoyed themselves in the VIP Tower and they had their sponsored Modified of JR Hurlburt on display on the midway. Tri County Microd had a display on the midway on this night. There was a $300 bounty on Butch Green in the Street Stocks, Green didn’t finish due to a broken ignition wire and by rule the money didn’t have to be paid out. But since being the last night the bounty was split up between feature winner Cronk and Green, they both received an addtional $150. Tyler Hart who was leading the Open Sportsman points coming into the show was disqualified after the race due to unsportsmanlike conduct in the pit area and received no points and no money. Mitch Gibbs shaking down the Randy Brokaw Sportsman for an upcoming big Sportsman race at another track. Dustin Harris looked good in his maiden Sportsman race. The show ended the 2018 racing season at Afton Motorsports Park. Track promoter Ronnie Ford would like to say Thank You to all of the racing teams, race fans, and track sponsors who stuck behind the track all year long. Information on the upcoming banquet and 2019 racing season that will be released shortly can found at www.aftonmotorsportspark.com. ZMK CONSTRUCTION MODIFIED FEATURE FINISH; Craig Hanson, Brett Tonkin, Rusty Smith, Mitch Gibbs, Darwin R. Greene, Paul Jensen, Steve Babicek, Kenny Titus, Alan Barker, Travis Smith, Jim Becker, JR Hurlburt, Tim Mayne, Jeff Rockefeller, Jim Introne, Jr., Jeff Sheeley. ZMK CONSTRUCTION MODIFIED TRACK CHAMPION; Brett Tonkin. CHAMBERS & O’HARA OPEN SPORTSMAN FEATURE FINISH; Dennis Clapperton, Skip Pickwick, Dave Rosa, Bill Deckleman, Dan Burman, Jim Gould, Craig Pope, Lisa Williams, Fred Christ. DQ; Tyler Hart. CHAMBERS & O’HARA OPEN SPORTSMAN TRACK CHAMPION; Dennis Clapperton. BUTLER AUTO SALES CRATE SPORTSMAN FEATURE FINISH; Corey Cormier, Gary Smith, Kamdin Maby, Rob Loucks, Aaron Shelton, Bobby Flood, Blaine Klinger, Michael Grover, Ed Utter, Fred Christ, Harold Renwick, Dustin Harris, Derrick Roe, Kinser Hill, Mitch Gibbs. BUTLER AUTO SALES CRATE SPORTSMAN TRACK CHAMPION; Corey Cormier. RINKER INSURANCE AGENCY STREET STOCK FEATURE FINISH; Dave Cronk, Doug Polhamus, Shane Wolf, Jr., Tom Donahue, Jake Fowlston, Jonathon Folwston, Matt Spencer, Ernie Staelens, Shawn Stalker, Ralph Cuozzo, Bob Crandall, Kyle Stark, Butch Green, Jason Burgher, Donald Briggs, Jr., Ron Greek, Steve Stalker. RINKER INSURANCE AGENCY STREET STOCK TRACK CHAMPION; Butch Green. THE TROPHY GUY IMCA MODIFIED FEATURE FINISH; Tyler Stoddard, Beau Ballard, James Cornell, Jake Maynard, Bill Nichols, Eric Stumpf, Lenny Miller, TJ Roe. IMCA MODIFIED CHAMPION; Beau Ballard. THE TROPHY GUY IMCA MODIFIED TRACK CHAMPION; Tyler Stoddard. FOUR CYLINDER TRUCK FEATURE FINISH; Ralph Cuozzo, Bob Crandall, Brandon Loucks, Scott Chapman. FOUR CYLINDER TRUCK TRACK CHAMPION; Ralph Cuozzo.